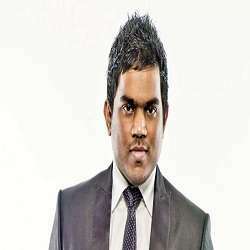 Yuvan Shankar Raja is the most popular and super hit music composer from India. His real name is Yuvan Shankar Raja and his date of birth is 31st August 1979. Yuvan Shankar Raja’s birth place is Coimbatore Tamil Nadu and right now he is 39 years old. Yuvan Shankar Raja is an music composer, lyrics writer and playback singer.